IBM DB2 Recovery Expert for Multiplatforms provides an enhanced data recovery solution that enables more precise recovery operations while reducing disruption during the recovery process. DB2 Recovery Expert creates and maintains additional recovery assets that you can use for intelligent analysis of both DB2 and DB2 Recovery Expert assets to find the most efficient recovery path. DB2 Recovery Expert facilitates the process of rebuilding your database assets, such as tables, indexes, and data, to a specified point-in-time, often without taking the database or the business operations offline. 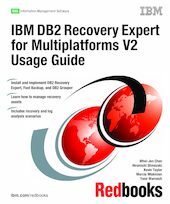 This IBM Redbooks publication shows you how to install and implement DB Recovery Expert and the Fast Backup and Grouper components. It also describes the DB2 Recovery Expert assets and how to manage these assets. In addition, this book explains the summary and detail reports of Log Analysis, including the DPF environment. It shows, in detailed examples, point-in-time recovery and cloning of tables, table spaces, and databases.